Congratulations to Stan Wawrinka, who joined an exclusive club not too long ago. I refer, of course, to ATP players who achieve a career high above 4000 ATP Ranking Points. (Ed note: I’m sure that’ll be Stan’s abiding memory of last weekend). Stan will be 29 in March of this year. He reached his first Major semifinal last year at the US Open, and had to beat the top 2 seeds in Melbourne to clinch his first Major title in his first final. It’s a great personal story – although Stan appears bemused by the number of people who now say they confidently predicted his eventual success. But focusing on an individual’s great achievement means we continue to ignore the deeper undercurrents in mens’ tennis. And when you look at the data, there’s only one conclusion. An ATP Dark Age is coming. Stan is the first player since Robin Soderling to break through the 4000 point mark. Like Stan, Soderling was a comparatively late bloomer: he first exceeded the 4000 point level in March 2010, at the age of 25. In fact, going back to the start of 2008, a span of six years, only 5 players have reached a career high of more than 4000 points: Jo-Wilfried Tsonga, Juan Martin Del Potro, Gilles Simon, Robin Soderling and Stan Wawrinka. 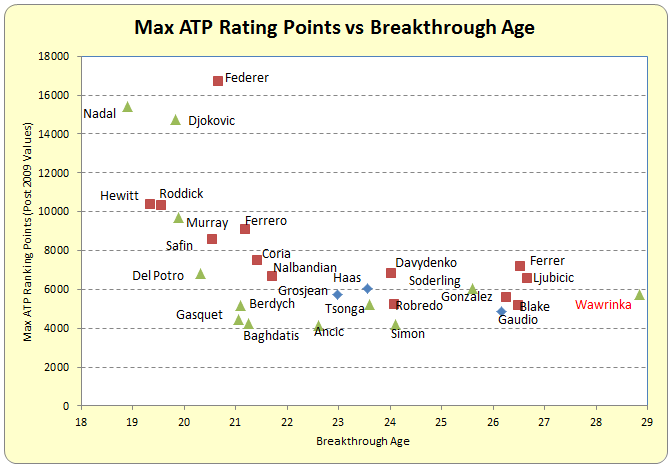 There are three sets of players in the chart: Gen Guga, Gen Fed, and Gen Rafa (for generations). Roger Federer was born in August 1981, Nadal in June 1986. Their birthdays are about 5 years apart. Players born between January 1984 and November 1988 are in Nadal’s generation. Those born between March 1979 and December 1983 are Generation Fed, and anyone born earlier is Generation Guga (for Guga Kuerten, born in September 1976). Stan Wawrinka may be Roger Federer’s team mate, but he’s squarely Generation Rafa. You could call him the 12th member of his graduating class. Generation Rafa was about as productive as Generation Fed: 14 players graduated from that class. Both “classes” have a mix of players, some of whom made their move at a young age, some in their mid-twenties or later. I’ll say more about that in a minute. No-one from Generation Grigor has “graduated” – reached a career high of more than 4000 ATP Ranking Points – yet. In fact, only 13 players in this group has even made it into the ATP top 50, and only one – Milos Raonic – has spent any time in the ATP top 10. 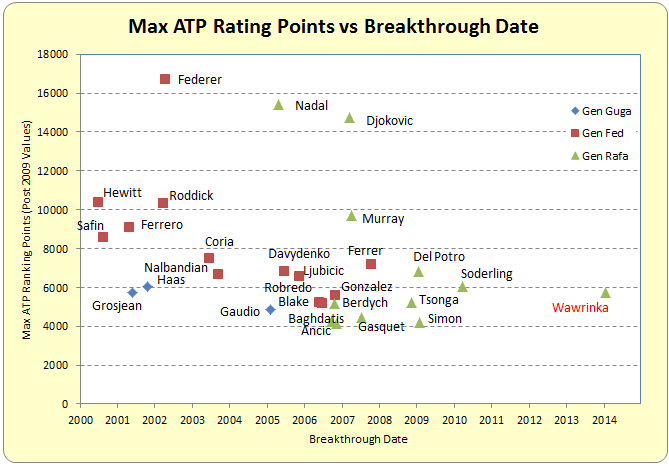 Of the players on this chart, only two who broke through after they were 21 – Gaston Gaudio and Stan Wawrinka – won any Majors. And both those guys benefited from higher ranked opponents getting into physical difficulty in the Final. I put a version of this chart in my previous article at The Changeover on this topic last November. 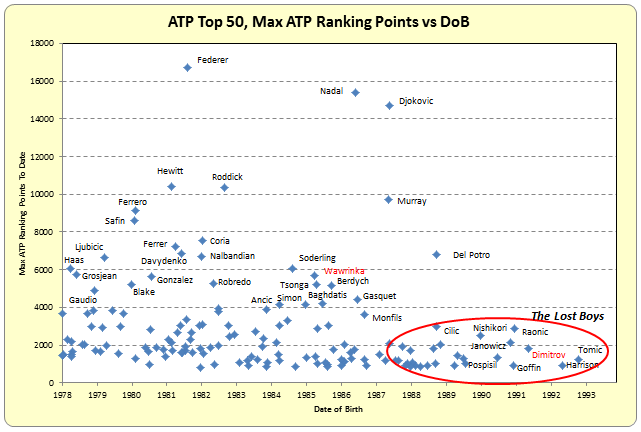 I’ve highlighted two players above: Wawrinka, now in the mid tier of post 2000 players, and Dimitrov – who, despite reaching the quarter final stage in Melbourne, is still a long way off from graduating. 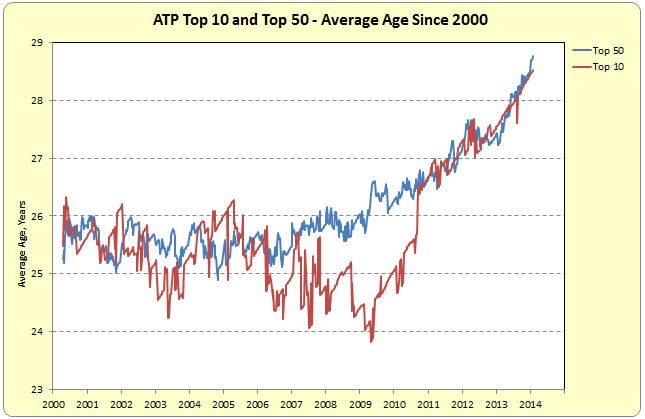 Since the start of 2007, the average age of an ATP top 50 player has gone up by over 3 years. That’s an astonishing change. And we know that the ATP isn’t stocked with strong players under 21. There’s nothing that suggests that this trend will slow or reverse. There’s an even more powerful implication in this data. It is the nature of sport that the old give way to the young. Fans of the WTA may have grumbled at those who loudly boasted of an ATP Golden Age, but no-one could dispute that the WTA has a terrific roster of players in their early 20s and younger. But Generation Rafa is playing into a vacuum. Generation Fed is in the process of retiring. 8 of the 14 members of this class have already retired: of those still playing, only one (Federer) is remotely a threat to win another Major. And there’s no-one from Generation Grigor who’s taken their place yet. Some commentators labelled the early to mid 2000s a weak era, and the last five years a golden one. Yet the golden era has a tin one to follow. As Murray, Djokovic and Nadal add to their haul of Major titles, the evidence shows that the players that came after them are an order of magnitude weaker than those that came with them and those that came before them. And when Generation Rafa begins to retire? Well, someone will have to win Major titles. 128 players will enter, and one will win. He’ll be rightly praised for his achievement. We can only hope that he’ll have played high quality tennis, but the omens aren’t good. Call me Cassandra if you like. The ATP Dark Age is coming. Very interesting analysis, and who doesn’t love a scatter plot? I’ve often wondered if the year or age of turning pro is a more telling indication of which “generation” a player belongs to. Of course there wouldn’t necessarily be huge differences in how these generations shake out, but the number of years on the tour seems like an important factor in defining a rate of success type measurement. Your thoughts? Yet someone will end up winning those slams even in the barren wasteland of the new ATP and if a Dimitrov happens to amass 6-8 then just by the prestige of the trophies he becomes a great champion regardless of the competition. Their playing level is qualitative but the number of majors is quantitative. And I wouldn’t underestimate the tennis media having every incentive to elevate the status of and collectively fawn over the next multi-slam champion. That’ll get the general sports fan to at least acknowledge there’s new No. 1 and trying to build a “legacy”. Narratives and constant reinforcement of said narrative by the tennis establishment will make this a non-issue for everyone but the most dedicated fans. It’s tough getting the big points when you run into one of the strong top 4 players at every major for so many years in a row. Not sure the comparison with the WTA crop of young players is right. It’s not like those younger players are winning the tournaments like Caro or Vika were doing at the same age. It would be interesting to see the same analytics applied to a few of the generations earlier than Gen Fed. I suspect we’re calling this a Golden Age not only because we foresee a lesser age in the making, but because its record of Big Four title hegemony is an outlier in tennis overall. What we consider “normal” is not static. This Golden Age has spoiled us. “Dark Age”, as a description of what we have to look forward to might be a little, errr, dark, Andrew. Interesting analysis but the data is only meaningful if the sport itself is an underlying constant. The so-called golden age has (whether temporarily or not) fundamentally changed the nature of the game and what you need to be at the top of it. To be able to step up to the big boys you have to have unprecedented levels of fitness and strength and that necessitates physical maturity. In that context, the fact that Generation Grigor has not or cannot break through yet does not necessarily mean that they are less talented or will play any less impressive tennis in a few years time. Not a guarantee, of course, but breaking through at an older age may become more common and, if so, comparisons to the past won’t tell us much about the future. This might be sacrilege, but I’m kind of looking forward to something of a “Dark Age” in the ATP. I certainly can appreciate and respect all that Federer, Nadal, Djokovic, and Murray have done and are still doing, but I think it could be refreshing to go into a Grand Slam event with little to no idea of who is going to emerge victorious. Sure, the level of play might not be quite what it is now, but I’ll gladly sacrifice that for a while in exchange for some unpredictability at the top of the game. I feel the same way, actually. And I appreciate all of the Big Four in their own ways. I’m really intersted in seeing where the WTA is going, too. Might we see a flip in general interest in one tour over the other? It’s been a little while since WTA was the more popular. I’m hoping for a “Dark Age” just so I’ll get more real life things accomplished. The writer of this article does a great job ignoring the period of time right before Federer, the era he’s calling the Guga Era. Do you know why he’s calling it the Guga era? Because a 3 time FO champion (who by no means has an overwhelming number of Masters titles) is by some distance the best player born in as much as an eight year period of birth years. Seriously. The group between Sampras/Rafter/Agassi and Safin/Hewitt/Federer is better than this, but seriously not by all that much, especially considering we’re only talking about three years so far. Yea, echoing Logan’s point above – after Sampras, Safin and Agassi retired – tennis had basically all new stars it seemed like in 02 to 05. Was that the dark age too then? Men’s tennis has just been in a spot the last 10 years where some of the best players to ever play the game are playing right now (Fed, Nadal, Novak). Murray may be able to join that list if he keeps winning majors. If one of those 4 guys wins basically every tourney, there are not many ranking points to acquire for the other players. In terms of the age of players in the top 10 and top 50 going up, I think that has to do with the all time greats right now are getting older. Also, tennis is just so physical, so guys have to be built up strength wise to compete from the baseline in these long rallies since you can’t go to net as much anymore to cut down the length of points. Having 3 star players over the past few years has made it difficult for other players to break through, especially for what you are calling the Dimitrov generation. Because of their seedings these players likely would meet a superstar before or at the quarter finals (unless there was an upset)and get stopped then. I think it was on this site that Darren Cahill was quoted about the players’ ages – they are are now breaking through in their mid twenties and having success in their late twenties. If that is the case, players like Berdych should be able to match Wawrinka’s success and younger players like Raonic at 23 and Dimitrov at 22 still have plenty of time to progress. Just because they are reaching their peaks at an older age does not mean they will be mediocre players. True, they won’t be stars for the ages like Federer and Nadal, but few players are.